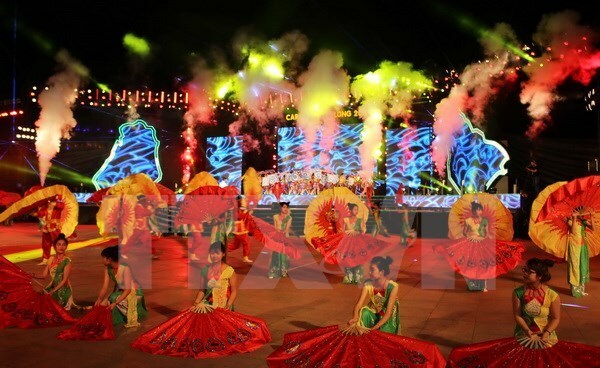 The annual Week of Ha Long Tourism 2017 will take place in the northern coastal province of Quang Ninh from April 28 to May 7, with the decade-long traditional Carnaval street festival to be replaced by an art performance. The organising board announced at a press conference on April 17 that the week will feature seven official cultural, sport and tourism events, to be held in Ha Long and Mong Cai cities. According to Deputy Director of the provincial Department of Tourism Trinh Dang Thanh, the province cancels the Carnaval festival in order to make better preparations for the National Tourism Year 2018 to be hosted by Quang Ninh. The art performance programme themed “Ruc ro Ha Long” (Brilliant Ha Long) will bring together many leading Vietnamese artists and troupes from Europe. Mong Cai will host the opening ceremony, the walking street and the cuisine street festivals , while the other activities, including an international beach volleyball competition and the province’s tennis tournament, will take place in Ha Long. Apart from seven main events, a series of other culture and sport activities will be arranged throughout the locality before and after the Week of Ha Long Tourism 2017. Quang Ninh is home to Ha Long Bay, which was twice recognised as a World Natural Heritage site by the UN Educational, Scientific and Cultural Organisation (UNESCO) in 1994 and 2000. The annual Ha Long Tourism Week aims to promote the locality’s tourism, thus attracting more and more tourists to the province.